Twenty-five years ago, it was the beginning of the 1990s, the decade of Titanic, 14 Mariah Carey #1 hits and Seinfeld. I was a 12-year-old 7th grader when the decade began and a 22-year-old college grad when it ended, making the '90s an important formative decade for me food-wise. And I remember the '90s as an important time of change when it came to what we ate. When I think of food from the '80s, I remember a fairly limited palate, not much international influence and a lot of convenience foods. Of course, these trends persisted in the '90s, but I also remember that decade as a time when people began to "wake up" to a lot of the food concepts we hold dear today. As my own food interests diversified, so did the available food options. Mediterranean influences really grew that decade, as olive oil became a household staple--one source states that consumption of the now ubiquitous fat grew 100 percent between 1991 and 2003. Fresh, local ingredients started to be emphasized more, even as inspiration increasingly came from far-off corners of the world. In Portland, Oregon these influences were perhaps best typified by Zefiro, Chris Israel's unforgettable cafe that merged Mediterranean tastes with Northwest ingredients (he now cooks at the delightfully German-French Grüner). For the next 2 weeks, I'm traveling back through some of the tastes I remember from the '90s. In the days ahead, I'll be cooking with pesto, bagels and sundried tomatoes--lots of sundried tomatoes. I'll also share a cocktail that takes me back to my college days and a milkshake from a once mighty Portland coffeehouse chain that has recently been resurrected. Today, though I'm going to start with a simple salad. When I think back to salad from the '80s, it went something like this: iceberg lettuce with carrots, tomatoes, croutons and creamy dressing--likely ranch or blue cheese. 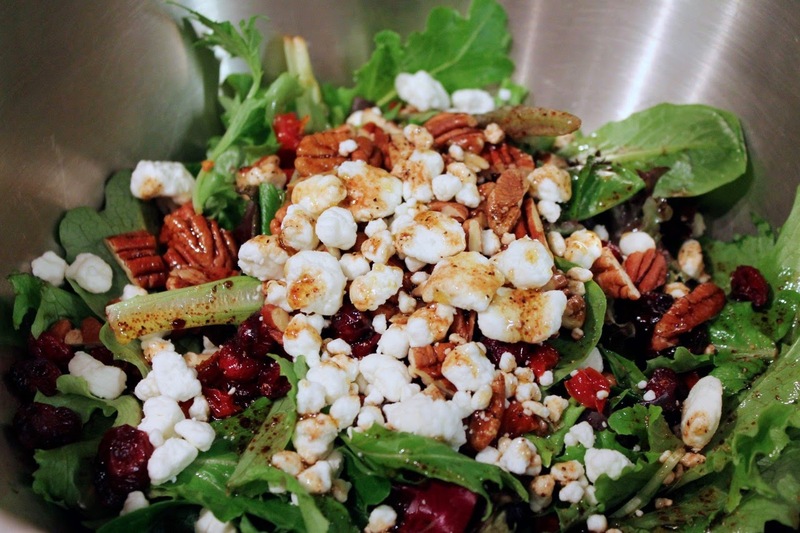 In the '90s, salad began its metamorphosis into what's more familiar today. It was during the decade I discovered that there were other types of lettuces, like romaine or leaf, a forerunner to all sorts of greens we put in salad today. I also discovered the vinaigrette, particularly if made with the seemingly exotic dark, sweet vinegar known as balsamic, which enjoyed a meteoric rise in popularity during that time. 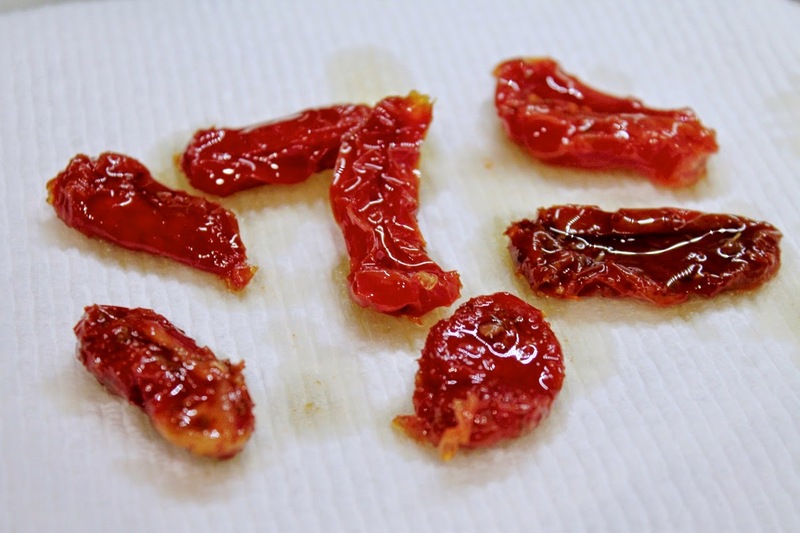 Sundried tomatoes are frequently packed in oil. I blot them with a paper towel to soak some of that up. And of course, sundried tomatoes were everywhere in the '90s. I bought a jar for several recipes this week, including this salad. I'd forgotten how good they are. You can buy them packed in oil either whole or cut into julienne strips. They are packed with good tomato flavor--the kind of umami-rich tomato flavor you get from tomato paste but with more texture, even a bit of tang. Come back tomorrow and we'll look at a cuisine that went hand in hand with '90s consumerism: mall food court food. 1. Heat a small frying pan over medium-low heat. Toast the pecans, tossing occasionally, until fragrant, about 8 minutes. Transfer to a cutting board and coarsely chop. 2. 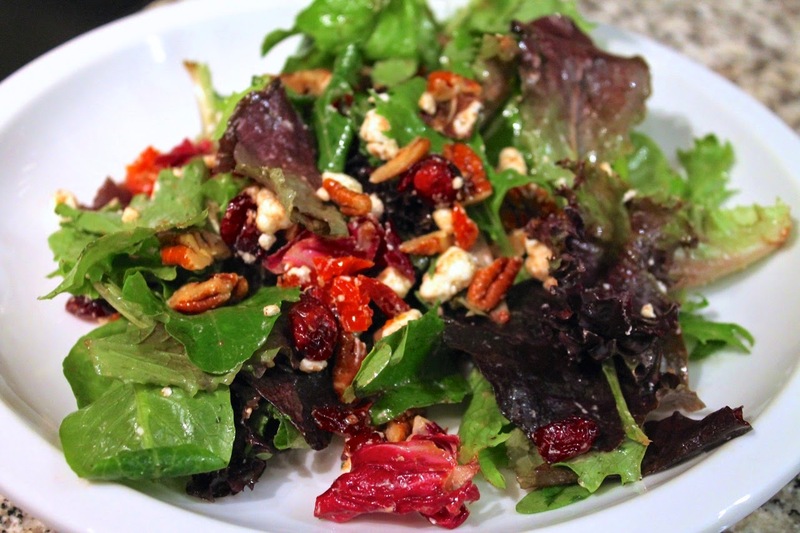 Combine the mesclun, goat cheese, sundried tomatoes and chopped pecans in a large bowl. Whisk together the vinegar, olive oil, salt and pepper and pour over the salad. Toss to combine and serve.